Summary: Animals in a zoo break their code of silence to instruct their lovable zookeeper on how to win the love of his life. 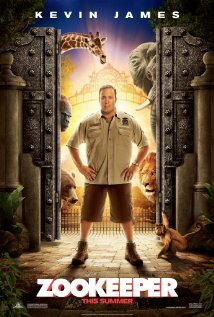 In Zookeeper, we have Kevin James playing “Griffin Keyes,” a devoted animal lover who works at the Franklin Park Zoo. His work with animals comes second in life only to his love, “Stephanie” (Leslie Bibb), but Stephanie despises Griffin’s job, and five years before the take-off point at which the film really begins, dumps him. When she comes back into his life after this period of time, Griffin is shaken into his expected bouts of awkwardness with the possibility of re-igniting the old flame. But Griffin’s turbulent, socially challenged nature is what sets him back. And so, after witnessing Griffin blow every opportunity to succeed at romance, the zoo animals can take it no more. They feel compelled to break their long-held code of silence in order to enlighten their favorite, most compassionate zookeeper on the ways of the world. Yes, in the universe of Zookeeper, the animals have done a flawless job of keeping their worldwide code of silence, being careful not to ever break it to do anything like convince humans not to oppress them, cage them, or eat them, or any real way, to make advanced communication possible between man and beast. Instead, these animals choose to break their code of silence to give advice to a dude with social hang-ups on how to date! We might ask, is it even important in a silly movie like this one that animals should consider themselves experienced on the matter of dating? We needn’t ask because the answer is, I don’t think the movie itself knows, not with an ape that digs T.G.I. Fridays. It’s all about being funny in the moment. And speaking of being funny, it has its moments. Griffin works with gorgeous “Kate” (Rosario Dawson) who is supposed to be the understated pretty girl sitting right next to him the whole time, Griffin’s best friend and the person he can share anything with due to the bond they share. But with a job offer to come and work at his brother’s high-end sports car dealership and leave his old life behind, Griffin feels compelled to please Stephanie with a nice, new job and a huge paycheck (no way you can count on him to just accept who he is and expect others to accept him, too). The movie was dependent on having a guy who thought he needed to be someone else before considering being himself. Kevin James is less out of control as he is in Paul Blart: Mall Cop, but still himself in character, always taking to extremes what he is taught by others until he gets sense knocked back into him from blunders made by experience. But of course, from the very beginning, everyone except the kiddos can see the direction in which this film is heading. And lest anyone think that Zookeeper gets serious about anything for any length of time, here’s me telling you not to think that. The only thing consistent about Zookeeper is its reliance on primal urges as a theme and the need to treat the hunt for love as a battle for mates. Griffin wants to take the advice of these very vocal animals on how to nudge back into Stephanie’s life, but he’ll have to compete with her loser ex-boyfriend-then-boyfriend-again, “Gale” (Joe Rogan). Griffin’s got competition, and much of the slapstick we get comes from these two tangling—and much of it is funny, largely, because it never tries to be. No timing is involved. It’s just funny when and where it occurs. Among the animals are “Bernie the Gorilla” (Nick Nolte), “Donald the Monkey” (Adam Sandler), “Joe the Lion” (Sylvester Stallone), and “Janet the Lioness” (Cher)—all less than creatively named animals as characters made to appeal to the little ones. Maybe I have a soft spot for Kevin James, but I’ll go on record as saying I wanted to laugh more than I care to admit. This was not a good movie, but it wasn’t a terrible one, either. The film may be guilty of forgetting its target audience with a few usages of harsh language and unnecessarily vulgar themes, including Griffin being taught by a wolf to pee on things to find a mate, but it does entertain, and in a way that doesn’t just rely on animal goofiness or trophy slapstick, or that now dried-up well of talking animals that we’re tired of seeing take center-stage in our kids films.